Like-it Magazine Holders is rated 4.7 out of 5 by 41. Rated 5 out of 5 by COKGB from Sturdy and functional I have about 10 of these magazine files and they hold various letter sized papers and cardstock, as well as some magazines. I like that I can stand them upright or lay them on their side, depending on the height of the shelf I'm using. Rated 4 out of 5 by SeekingContainment from Still Like-it A few years ago, I bought four magazine files at the Container Store in the same style as other current Like-it desk items. The current Like-it magazine file is sold as a 2-pack, with one inside the other. I was surprised to find that the inside one is slightly narrower than the one outside. If your use requires careful spacing of the files on a shelf, or of the contents within each file, measure carefully! The current version has a finger pull hole, whereas the earlier one had a metal label holder with an integrated pull bar. The current one is completely open on the back, so contents can start to fall out when the file is pulled. This didn't happen with the earlier one because the back was closed for about 6 inches up from the base. The current one is made of a more rigid plastic. Can't recall the price of the earlier one, but think the current one is less $$$. I still like it, but not quite as much as the earlier version. Rated 5 out of 5 by Lalla from All purchases are exceptional! Every item ever purchased since Container Store opened is still in my home or moved on with my children! That's a long time! Rated 5 out of 5 by Stampninklady from Perfect I have been looking for these Magazine Files for a long time for 8.5 x 11" cardstock storage. They are perfect for my needs and will be ordering more! Rated 2 out of 5 by FrogNYC from Flawed design I have other Like-it products and have been impressed with their appearance and quality. But these magazine flaws have a flawed design. Because they are completely open on one side, whatever you put into them tends to fall out unless the file is jam-packed. Rated 5 out of 5 by ShopGirl75 from Great Product These worked exactly for what we needed them for- to hold our surgery folders. Rated 5 out of 5 by onehotmomma from Need more! These are great for my magazine storage. I need to be able to see the volume and month on my magazines for quick reference and these holders are just what I needed. They hold a lot of magazines and look great on my shelves. Rated 5 out of 5 by MNNana from Great for storing! This solved my problem for magazine storage. This comes as a 2 piece set and is quite sturdy. The price was very reasonable. Rated 4 out of 5 by Avatar from Awash in papers and magazines - mopping things up As an independent contractor covering research in 4 areas, I have to have printouts and journals of articles. My method, stacks, worked for a while. But after 14 years, I found myself awash in papers and journals. Laying flat on the floor the titles are not visible. I couldn't find important articles and the stacks accumulated dust and cat fur. Like-It Magazine Files are my new life-saver. My floor is clear and because they are too, I see the titles of magazine and folders. My home office is clear, too, and so is my thinking. I will be buying more to keep on hand as I win more contracts due to my increased productivity! Rated 5 out of 5 by Mostgirlicious from Wonderful! I subscribe to several magazines and some of them I want to keep for reference (Arts, History, Travel) . My magazine stacks were out of control and I started looking for some sort of way to organize them. These organizers are a great choice! They are sturdy, lightweight, well-made and translucent so you can see what you have. Labels are included if you want to use them. I bought 13 sets (! ), so I have 26 of these organizers. Another reason for buying these is that they don't add visual clutter to my office area. You will be happy you chose these organizers! Rated 5 out of 5 by lmay from great great great the best overall product I have bought so far to clean up my bookcase. I used this to arrange my shopping catalogs and my vacation books. Would I do it again--- YES! YES! YES! Rated 5 out of 5 by Tuzette from Just what I needed The smoke version worked beautifully as a neutral color magazine file to blend in with a library of brown covered bound volumes. The finger hole in the spine works well in handling the files. Rated 5 out of 5 by JoanLady from Well Constructed The files are very sturdy and great for storing different types of letter size paper. The solid end is the perfect place to label the content of each file. Rated 4 out of 5 by Teenerwest from Great item I am always in the market for a good magazine/folder file. In my quest for organization in my office at home it's a great way to keep things contained. Rated 5 out of 5 by momkidder from Love them The only problem was that I didn't order enough! No more messy book cases from my kids little reading books. Rated 4 out of 5 by wornstones from Great for iPad and MacBook I have looked high and low for a magazine file that doesn't have the lip on it that keeps the magazines from sliding out. Without that lip, I can set this on the long spine and just slide my iPad and MacBook in and out, and the cord being attached doesn't even present a problem. I put rubber stick-on feet on it, so it wouldn't slide when I pushed the device into place. I can have both items next to my chair and they take up almost no room. Rated 5 out of 5 by reDesign from My favorite magazine files These files are so clean and simple, like the rest of the Like-It system. I have the spine facing the wall, and the magazine edges facing out, so I can easily pull out a magazine without pulling out the whole file. This also gives the look of the magazines just being tidy on a shelf, not obvious that they are being held in any containing device. I also love that these come 2 to a pack. Rated 5 out of 5 by LoveToOrganize472 from great product exactly what I needed to keep all of my husbands beer making magazines in one place, instead of scattered throughout the house. Rated 5 out of 5 by KCasey from Mag File Good design for empty files to nest in each other. Rated 3 out of 5 by songofjoy from functional but could be sturdier The open-end access is a nice feature for sliding documents and folders and in out. The sides of the files bend a bit too easily and had to be clipped to the sides of adjacent files to try to restore their shape. They should be sturdier and less prone to bend. Rated 5 out of 5 by OrganizedSTL from A Pair that's Priced Perfect! If you've ever purchased corrugated magazine files and gone crazy dealing with the annoying hassle of assembling them (if you don't rip them in the process) and hoping they don't fall apart- try these. They're a really economical solution if you have tons of magazines, and it's nice that you can see the entire spine of the publication- not just the top. Highly recommended! Rated 5 out of 5 by oldtimer from They worked I bought these to hold my paperback cook books that were forever falling over in my pantry. Now I can remove items from the pantry without the cook books falling on the floor . Rated 5 out of 5 by Anonymous from A Real Keeper! I purchased six sets of two smoke magazine holders. These are the best. I have thrown away or donated so many over the years. These holders are tall and much sturdier than any I have seen. They will be used in my husband's "man cave" for his manuals, etc. I expect them to last for many years. Rated 5 out of 5 by Organizationist from Easy pull-out magazine file I purchased this magazine file in their grey smokey color along with the chocolate Bristol magazine file and both look very nice together. I put them on my dark cherry wood desk and they are perfect for the desk. Rated 5 out of 5 by Wulee from Great Buy Very nice. Sturdy and clean lines. Won't break or bend when you grab the file. 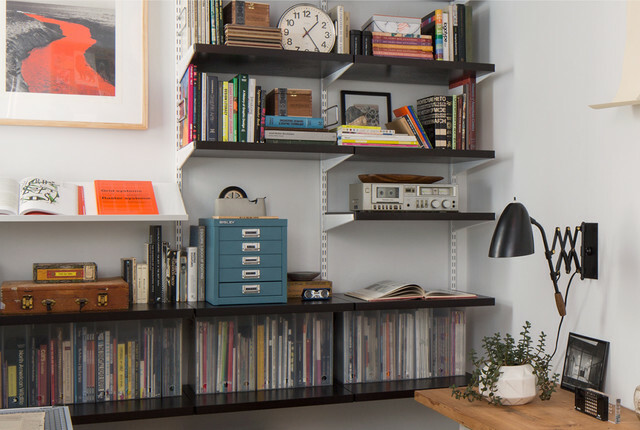 The perfect organizing system for magazine hoarders. Rated 5 out of 5 by maggiemaggz from great to use either upright or on side I presently use these to access files I need regularly. They are so handy because you can set them upright or on their side. Rated 5 out of 5 by DianaD from Attractive and Economical These are my favorite for storing magazines. They are attractive in an unobtrusive way. While they are not as strong as the hard acrylic, they are strong enough for storing magazines, especially if you have them on a bookshelf. And they are much less expensive than the acrylic. With these files, you get 2 to a pack, one packed inside the other, so 1 is slightly smaller than the other. Although this is not visible to the eye when viewed on the shelf, you can probably fit 1 more magazine in the larger file. Each set of 2 comes with 4 stick-on file labels. Rated 5 out of 5 by jackman from good looking good value Purchased these magazine organizers for my office. After looking at many different versions I found these and liked the simple minimal design ( aesthetics are important to me ) and cheaper than the many cardboard and colored or printed board versions which fall apart easily. One reviewer said these are sold as a nested pair and not identical in size, but the description lists only 1 size. May I have both set of dimensions? The only dimension that allows our Like-it Magazine Holders to nest is the width; each pair of Magazine Holders includes one that is 3&quot; wide and one that is 2-7/8&quot; wide. I want to place these on a shelf that is only 11.5 inches of space in height. Can I turn them sideways and have them fit. The dimensions of the Like-it Magazine Holders are 3&quot; wide x 10&quot; deep x 12&quot; high. They can be used horizontally for storage. how many normal sized magazines will this hold? Each Like-it Wide Magazine Holder should be able to accommodate between 20 to 30 magazines, depending on the thickness of the publications. Would these be able to store binders? This product can be used to store binders. Is the material flexible or stiff? Our Like-it Magazine Files are made from sturdy yet flexible polypropylene plastic. Art director/designer Spencer Matern definitely has some good vibes going on in his newly organized home office. It's situated in his cozy 1940s apartment, located in Chicago's Ukrainian Village that he shares with interiors stylist girlfriend Miriam, and their cat, Monster. The room doubles as a work area and a music room, and we love his vintage aesthetic and creative use of office storage space.